With 180,000 visitors and more than 4,500 exhibitors, CES 2019 maintained the momentum from previous years at the intersection between consumer verticals (automotive, smart home, entertainment, and healthcare/wellness) and underlying technologies, such as computing and short-range wireless semiconductors and connectivity, AI (Artificial Intelligence), AR (Augmented Reality), robotics, and video. However, new and adjacent areas, including smart cities, retail, blockchain, and financial services, remained largely marginal. At the same time, focus was somewhat shifting from long-term visionary, transformational, and disruptive innovations to shorter-term incremental enhancements as well as using new technologies to improve existing products, services, and solutions. 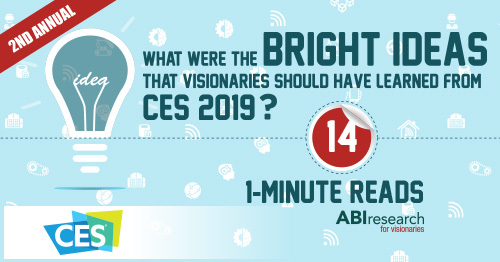 We have focused on the most compelling technology findings from CES 2019 into this whitepaper — a total of 14 1-minute reads. Download the PDF. The U.S. Committee on Foreign Investment in the United States (CFIUS) has cleared the proposed US$25.6 billion merger between T-Mobile and Sprint, paving the way for a merger of the country’s third- and fourth-largest mobile operators. Approvals are still required from the Federal Communications Commission (FCC) and the Justice Department. If the two companies receive those approvals, then T-Mobile expects the deal to close during 1H 2019. Neither T-Mobile nor Sprint operate their networks in the United States using any Huawei equipment; however, the devil is in the details. Sprint’s parent company is Japan-based SoftBank and T-Mobile’s parent is Deutsche Telekom (DT) in Germany, both of which do use Huawei equipment. 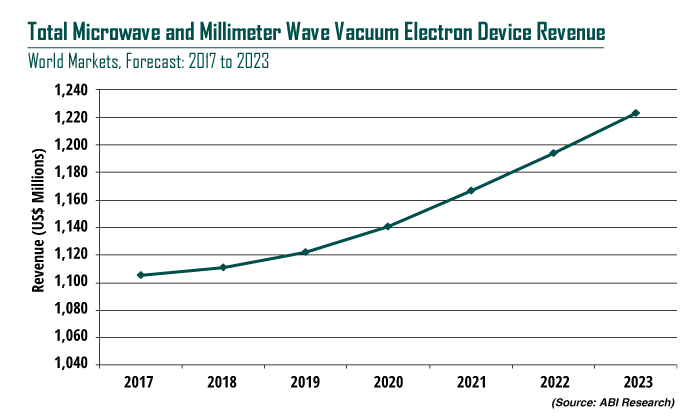 While microwave and millimeter wave high-power vacuum electron devices (VEDs) remain “below the radar” of many industry observers, the total available market (TAM) for this segment is over US$1 billion, finds ABI Research. Despite its size, and although these tubes remain essential elements in specialized military, scientific/medical, and space communications applications, this market is generally under-reported and poorly understood by those not directly involved in it. Essentially, this continues to be a stable industry despite several rounds of consolidation in the past decade. “While, there is some potential for further consolidation, there are no signs of that happening yet. However, one competitive RF semiconductor technology — gallium nitride — will change the landscape. While it is not yet near monopolizing the microwave RF power industry, GaN is advancing steadily and is a technology that should be closely watched, as it will be a threat to some aspects of the microwave and millimeter wave VED marketplace,” said Lance Wilson, Research Director. Read more. Despite the smartphone market’s slowing growth due to saturating addressable markets, ballooning Average Selling Prices (ASPs), prevailing consumer price fatigue, and lengthening replacement cycles, all is not lost. According to ABI Research, the market is to witness a 4.1% rise in shipments in 2019, growing to just under 1.6 billion for the year. It is expected that the use of 5G and flexible displays will be the catalysts to galvanize the industry, creating improved user experiences (UXs), while stimulating smartphone replacement rates. “For too long, major vendors have been lambasted for upgraded devices looking far too similar to their predecessors, with iteration rather than design innovation becoming the norm,” says David McQueen, Research Director. “In fairness, it has become increasingly difficult for vendors to differentiate on features, with price being one of the very few competitive factors left, but new technology innovation and features are just around the corner to help arrest this decline.” Read more. Jake Saunders, Vice President, Asia-Pacific, discussed with the BBC how slowing smartphone sales hit Samsung's profits. He told the BBC: "It's showing that they are under pressure — about half of their revenue comes from mobile devices." Watch the 2:04-minute video. According to ABI Research, an estimated six million workers around the world will receive wearable technology, such as Fitbits or Apple Watches, as part of company-sponsored wellness initiatives. Features such as activity and fitness trackers and heart rate monitoring help companies keep their workforce healthy, increasing overall productivity and reducing the chances of unexpected visits to the doctor. In addition, health insurance companies may offer financial incentives benefiting both employers and employees who choose to use these devices, helping drive significant cost savings. Coming in 2019: further integration of these devices into patient monitoring portals set in place by physicians and hospital networks. Read the full article.